Robertson's Rules of Disorder: There's a Ratte in my Game Room! Indeed, there is a Ratte from West Wind Games - the huge hypothetical vehicle designed by Hitler which was never started other than as some drawings and specifications. However, it would have been exceedingly fun to have witnessed it built and then sent off into combat - almost like steampunk without the steam! So, here is the "out of the box" review - first off this thing is HUGE - it easily dwarfs probably every model you own. Even if you own a Forge World Titan - it is still HUGE - it is easily larger than a Baneblade tank in length and size and the turret is simply amazing. For starters this thing weighs in at just under 6 pounds (figure that out in kilograms if you would like). That is WITHOUT the metal bits which go on it which should push it up to right at 6 lbs. So, here is the picture of the Ratte with a Games Workshop Valkyrie on the flying base RIGHT BEHIND IT! Yes, it is HUGE. If you have played Warhammer 40K, and you have seen a Valkyrie on a flying base before you have some idea of what size this thing is right out of the box. Yes, in the back on the right, that is a Forge World Warhound Titan in the process of being built as well as several other Forge World Tau vehicles. Such is painting night and our painting table these weeks as everyone is gearing up for an Apocalypse battle. Below is the hull right out of the box - note the broken hull piece which was located and fixed in the photo above. This piece was the easy one to fix - it popped out clean and went back in clean. A very simple fix with a drop or two of super glue. Note in the photo above the damage to the rear of the hull assembly and the deck plate - a full inch and a half of shattered side plating, including the details of the ladder. The corner piece of the deck plate which flared out also shattered off in shipping. Here is the rear view of the hull - note the extensive shipping damage to the rear of the hull plate? These pieces shattered and were so small that even I could not figure out how to put "humpty dumpty" back together again. These pieces are destined for the dust bin and it looks like my old friend epoxy sculpt will be paying a visit to fix the damage and hopefully I can repair that ladder as well. Just a bit of anger here. Here is a close up of the damaged to the rear hull side. Nearly two inches of shattered hull side, including the damage to the ladder up the side of the hull. I will see if I can get my epoxy sculpt to fix these issues - but it is going to be a several hour job of putty and sculpting tool work - and that is after I do some drilling to stablize the putty when it cures so it doesn't break off. 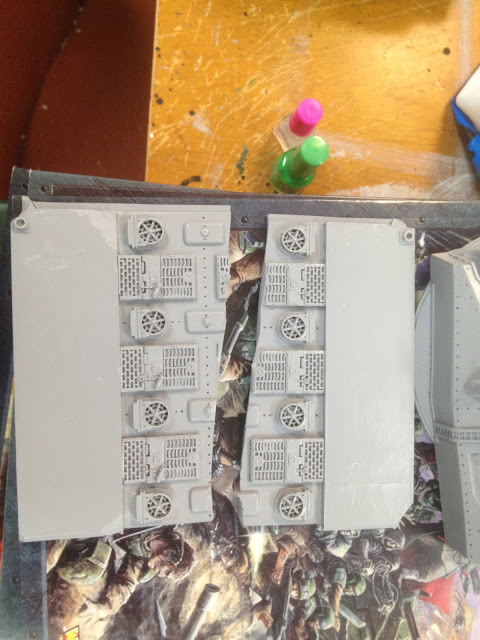 This is the most disappointing part of the kit right out of the box - the rear deck plate with all of those beautifully sculpted engine grates was shattered into two pieces and the seam went right through two of the engine grates. Also the corners of the model were destroyed for the part where they match with the front hull section. They are just GONE - nothing but small flakes of resin from the model - so this will also require some difficult putty work to fix - that and some plastic card to stablize the deck and keep it from breaking again where it was glued back together with superglue. I did not pin it because this resin is not like other resins I've worked with, it is much denser than other plastic resins. So, there you have it - the Ratte - right out of the box. I will try to get pictures posted of the man, many projects I've got going on right now, but it has been hectice - sometimes life takes you places you never expected to go! So, if you like Steam Punk or Weird World War II games, this is a model which just might fit the bill for your games - whether it is in 15mm or 28mm - it is so big - it would work in either scale! Cheers and happy gaming! UPDATE!!! I sent them an email of the broken Ratte and informed them that whoever packed it did not do a very good job, and they are sending replacement parts today! Now THAT is excellent customer service!! !